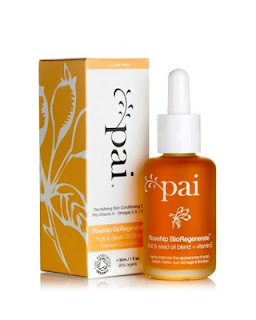 If you read my winter skincare routine, you already know that I've added Pai's Rosehip Bioregenerate Oil to my nightly routine. Rosehip oil can be extracted from either the seed or the fruit of the plant, and Pai's oil contains both types. It's also extracted using CO2 supercritical extraction, which is supposed to deliver the complete and concentrated properties of the plant much better than simple cold pressed oil. According to Pai, this method also extends the shelf life of the product from cold pressing's six months to a full two years. Rosehip oil is high in vitamin A and has been proven to be effective on scars, sun damage, fine lines, and stretch marks. I've mentioned before that I have two small lines on my forehead and they're what I was mainly hoping to target with this product. Keep reading to see how they fared! Pai BioRegenerate™ Rosehip Oil is rich in concentrated Trans-Retinoic Acid, an essential fuel for the skin's natural repair function. Rosehip is the ultimate skin multitasker. With regular use, it conditions the skin, improving skin firmness and elasticity. Refines appearance of damaged skin and fine lines. High levels of Trans-Retinoic Acid delivers Pro-Vitamin A to the skin without causing irritation. Most concentrated Rosehip Oil on the market today. I've tried applying the oil as an all over face oil, but I prefer to focus it just in certain areas of my face. Like I said, I have those two pesky fine lines on my forehead and also some redness and what I think are broken capillaries around my nose. Most nights, I put a single drop on the back of my hand and with clean fingers, just dab it onto those two spots. When I've applied the oil all over my face, it sinks in pretty quickly, but in focusing it on such small areas, the skin in those places ends up more saturated, so it takes longer to absorb. I've only been using it at night, so it's not an issue - I apply it before bed and it's completely absorbed by the time I wake up. To me, the oil smells like a souped up, super strong cup of rosehip tea. That said, I've had three other people smell it and they all claim it smells kind of like chocolate. Personally, I don't smell chocolate at all, but there you have it. In terms of results, I'm having a hard time judging if it's made a difference on my fine lines. They aren't terrible to begin with and I find they're more and less visible at different points in the day anyways, depending on how hydrated my skin is. Right after I wash my face, for instance, even before I apply any toner, oil, or moisturizer, they're barely noticeable, and then throughout the day, they become more visible as my skin gets a little drier and makeup starts to settle into them. If I had to guess, I'd say that yes, the lines have gotten smaller in the month I've been using Pai's rosehip oil, but it's hard to say for sure. I can say with a lot more certainty that the oil has definitely helped with the redness and broken capillaries around my nose. These are something I pay attention to concealing every day and I've definitely noticed there is a lot less to cover up since I've been using the BioRegenerate Oil. Pai is a great brand that really seems to care about making effective products without compromising on ingredients. I love that their entire line is targeted specifically for sensitive skin and that the Rosehip BioRegenerate Oil is certified organic. I wish it had made a more dramatic difference with the lines on my forehead, but it's very possible they just need more time. The oil has definitely improved the redness and broken capillaries around my nose and I'm going to continue using it. I'll keep you all posted - hopefully I'll have more to report back on after using this product for longer! I used to have these pesky lines on the side of my mouth -- I think they are called periorbal lines? Anyway, I used so many types of expensive creams and serums in the past but nothing made as much difference as when I switched to using facial oils. I have a lot of faith in almost any type of vegetable oil as long as it doesn't break me out. I guess I should be more patient. Definitely giving it more time and hoping for the best! And I agree, oils are some of the best things you can do for your skin. I use facial oils at night,at daylight I use those non oil one.It works better that way for me though...(currently fighting this 1 frown line on between my eyebrows).. I loved this for the first little while, then it started breaking me out. I guess my idea of results is whenever I don't get acne of any kind lol. I got some lines and scars and must agree with facial oils reducing them, as well as acids in there. Loveeeee aha's, glycolic, lactic acids for brightening and minimizing the appearance of wrinkles. Great review! @Lovely - I'm not familiar with most of those. For now, I'm happy using the oil, even if it takes a bit longer to see results. @Bilbo - That's the thing with blogging I think... you're always wanting to try out something new. It can be hard to stay loyal to one product, even when you like it! Hi Caitie love the review. i know it's from several months ago but I just wondered how you were doing with pai now. if you're still using it i mean. i used pai for about 6 months a while back and I mean it was nice but it wasn't anything amazing. I've just started (about 4 weeks ago) using Biocorrex healing oil and i think it's really greatly improved my skin feel and the look of it. But, and it's a big but, it is a little pricey so I wondered how you'd compare the two oils and ingredients etc.??? Thanks! To be honest, I'm not using the rosehip oil regularly anymore. It helped with redness initially, but I didn't find it did much else, even with continuing to use it for longer. I've started mixing it in with my body lotion and it's great for that, I just didn't get the results I was looking for on my face. More recently, I've been using plain organic argan oil in combination with Osmia Organics' Active Gel Nutrient Serum (not the cheapest product either, but I'm still working my way through a sample - you only need a tiny bit.) I've noticed a difference in the overall feel of my skin since switching to these two products.